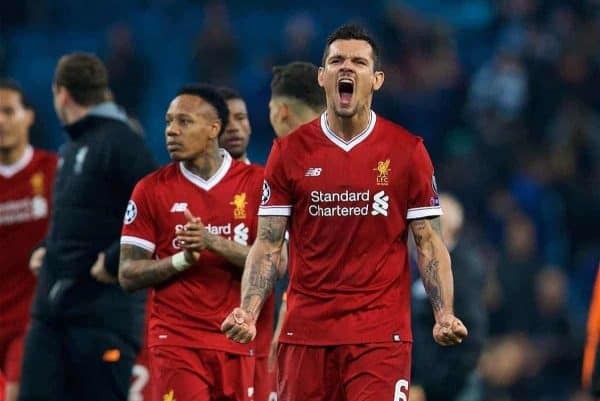 Liverpool’s players are in buoyant spirits after their Champions League quarter-final win over Man City, taking to social media to air their delight. Every single individual shone bright at the Etihad on Tuesday evening, recovering from an early deficit to win 2-1 at the home of the soon-to-be Premier League champions. Goals from Mohamed Salah and Roberto Firmino helped earn the Reds a stunning 5-1 aggregate win, and the semi-finals now beckon. It is a special achievement by Jurgen Klopp and his squad, who showed enormous heart and quality in both legs against an exceptional City side. Once the final whistle had blown and the players were able to find their phones, they took to social media to express their joy at the achievement. We are in the @ChampionsLeague semifinals guys??? ?Amazing job tonight boys. Thanks to all the fans for the incredible support ????? WHAT A NIGHT!! #YNWA ? Once the ecstasy of reaching the semi-finals subsides, attention must swiftly turn to Saturday’s Premier League clash at home to Bournemouth. Another win for Liverpool would further enhance their chances of Champions League qualification for next season, with three wins from their final five league games guaranteeing a top-four finish.